Here on Life with Lynnie (LwL), I'll be sharing some information with you. Well, it's regarding a postcard I received. I must admit, I was surprised receiving the postcard! You're probably wondering why I received this postcard. And, possibly even why I'm shocked receiving it. It's been quite a while, since I saw Dr. Kevin Peterson. In the past, I believe I mentioned him here on LwL. However, I've never since received any mail from him. Or, from his office/staff... until this postcard arrived! Even so, I thought I would encourage you to know about Dr. Kevin Peterson, in case you aren't aware of why I saw him. Before I had that truly major surgery, I had trouble finding a surgeon to do the surgery. My daughter and I had been told that I needed to have every piece of mesh inside me (which I had a LOT of placed within me many years ago, because my inner lining had been destroyed), removed. We were told that the surgery was so dangerous that I needed to have a will made. And, I needed to be prepared to die, because most people would not live through the surgery I needed done. Because the surgery I had in September 2012, didn't turn out well for me, and I had to have repeated surgeries and found out that even though a tiny piece of mesh had gotten infected, all of the mesh had to be removed. This meant that a surgeon would have to not just remove the mesh, and deal with an abscess within me, they also had to use my muscles to reconstruct me. Originally, I was told there were only four (4) surgeons here in the province of Ontario, Canada, who could help me. However, two (2) surgeons were not accepting new patients. My cousin. E... who lives in Lake Havasu City, Arizona, USA helped me on the internet to try and find a surgeon, in case I wasn't able to obtain a surgeon here in Canada. We both agreed that I should see Dr. Kevin Peterson. So, I set up an appointment, and flew to Las Vegas, Nevada, USA where Dr. Kevin Peterson's medical office is located. My cousin, E picked me up. I not only got to visit with her, but she also went to my medical appointment with me. So, we both got to see/meet Dr. Kevin Peterson. To be honest, he was truly a blessing to me. Even though he had to suggest I try and get a surgeon in Ontario. Because he made it clear to me and my cousin, E... that even though he would be able to do surgery/surgeries for me, it would be better for me to have it done in Ontario, where the cost would be extremely less than what it would be in USA. Dr. Kevin Peterson, was truly a blessing to me. He did what was necessary to me, to help me, and not hurt me by having me hire him to do what needed to be done. Yet, if necessary, he was available for me if it didn't work out in Ontario. To me, this meant that he thought I was more important than him. And, he obviously thought of my need as being more important than his need. Thinking of this, made me think of Philippians 2:3, "Let nothing be done through strife or vainglory; but in lowliness of mind let each esteem other better than themselves." Amen! Anyone who belongs to God, must let nothing be done through strife or vainglory; but in lowliness of mind let each esteem other better than themselves. Dr. Kevin Peterson, truly did this. Not just by referring me to try and obtain the surgery in Ontario. When I went to pay for the appointment I had with him, I was told that he wasn't charging me. Yes, it's true. He blessed me by not charging me any fee. So, I ended up paying him/his office... zero dollars ($0). As you probably know, I found a surgeon in Toronto, Ontario, who let me know that he would do the surgery I needed, but couldn't do it at his hospital, because they won't allow people from all over the province to go there. Unfortunately, he didn't do my surgery, because he also wasn't able to obtain a surgical room to use at any hospital, here in Windsor. So, God provided for me, by having the last of the surgeons available to help me... surgeon number 4 available here in my province... and my surgery was done in London, Ontario, Canada. For this, I thank Dr. Neil Parry, who did my surgery in London. He was truly a blessing to me! I also thank Dr. Kevin Peterson, for doing what he could to help me do what was best for me. He was also a true blessing to me! 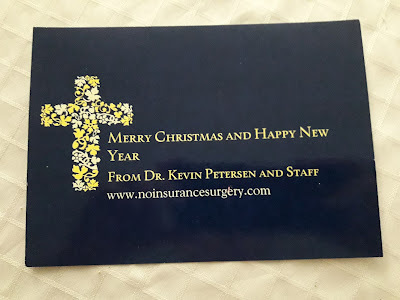 And, he may be to you, if you contact him and/or check him out on his website: http://www.noinsurancesurgery.com/. I'm thankful to be able to encourage you, if you need medical help/support. And, of course... I thank my Lord... for loving me and providing for me! Please Pray for UK...and FG!